Comments and suggestions are welcomed and encouraged. The license agreement is available here. It is also presented when initially opening the application's disk image. What is needed to read ArchiveMac discs? ArchiveMac created discs can be read on Mac OS X, Windows XP sp2, Linux. On Mac OS X, Finder can be used to copy files from ArchiveMac discs. Can you restore split files without ArchiveMac? 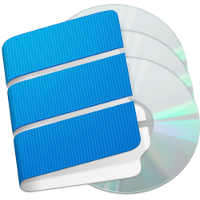 ArchiveMac provides the easiest way to restore files which have been split across multiple discs. Split files can be restored without ArchiveMac using the command line on various operating systems. ArchiveMac splits files into segments. To manually restore a split file, manually copy all of the segments of a file to one directory. Open a terminal or command line window and "cd" to the directory where you've copied the segments. Use the appropriate command listed below to recreate the original file. Replace filename with the name of the restored file. Yes. 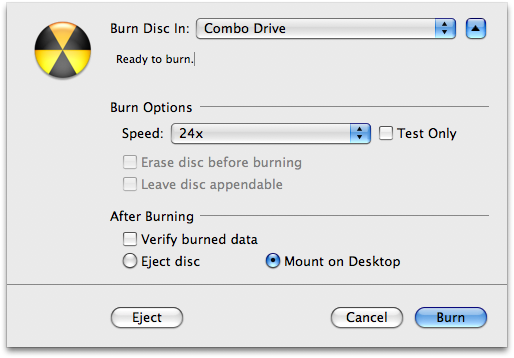 After clicking the Burn icon on the toolbar, a dialog is presented which displays the name of the burner which will be used to burn the discs. To the right of the burner name is a disclosure triangle. This is a button. If you click it, a more detailed burn configuration view is presented. This view includes options to configure burn speed as an option to verify the disc or not.